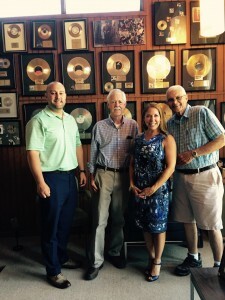 Chase Curlee, Broker of our Guntersville office, and Amanda Howard, Founder/CEO, recently had the privilege of meeting radio personalities, Kerry Jackson & Bruce Underwood, at WTWX-FM – Country 95.9 in Guntersville, AL. We knew this town was rich with history and charm, but it became even more apparent while meeting these guys. They were so much fun! Chase and Amanda tell us it was a really cool experience to walk through the halls of this quirky building and see all the records and history ingrained in the fabric of the station. It’s a station that’s been handed down through three generations and is filled with great friends, family, and lots of laughs! ! We are so grateful to get to share some time with them and to have their support of our new office Amanda Howard Real Estate-Lake Guntersville. We appreciate them welcoming us to the community with open arms and we look forward to another visit soon!